Clockwise from top: Wooden sheep with metal legs from World Market (Thanks for the tip, Marlo! 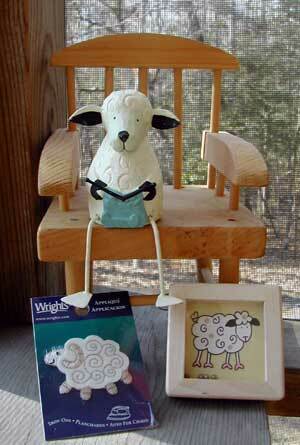 ), wooden sheep game (get the four ball bearings in the holes) from Pier 1, and a Wrights iron-on appliquÃƒÂ© from Walmart. hahaha :) that is baaa ry baa ry cute! Oh CUTE! Those are so cute. But Sheepie is the best. I’m proud to have him?/her? on my website. Sheep are the best! Thanks for the link of the glittery crochet hook – yuMMy! Very cute sheep! Have you ever seen Wallace and Gromit? Shawn the Sheep from Wallace and Gromit is pretty cute. He wears a knitted sweater. Something with him on it might be a great addition for your collection. what is it about these little guys? !